Above treeline in the open bush edges of Rhododendron campanulatum, a (most likely) breeding pair was observed foraging on the grassy meadow at an elevation of ~3400m. 654. Ianthia rufilata. 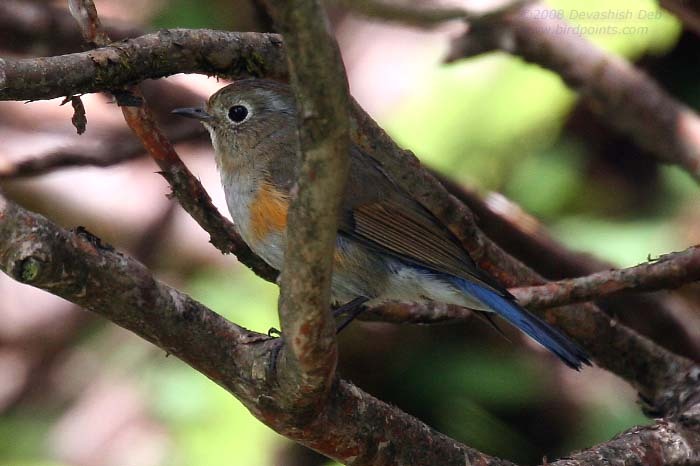 The Red-flanked Bush-Robin. Nemura rufilatus, Hodgs. P.Z.S. 1845, p. 27; Horsf. & M. Cat. i, p. 299; Hume, N.&E. p. 324; id. S.F. xi, p. 198. Ianthia rufilata (Hodgs. ), Blyth, Cat. p. 170; Blanf. J.A.S.B. xli, pt. ii, p. 52; Brooks, J.A.S.B. xli, pt. ii, p. 77; id. S.F. iii, p. 240; Oates in Hume's N.&E. 2nd ed. ii, p. 68. Ianthia cyanura (Pall. ), apud Jerd. B.I. ii, p. 146; Stoliczka, J.A.S.B. xxxvii, pt. ii, p. 44. Nemura cyanura (Pall. ), apud Hume, Cat. no. 508; Scully, S.F. viii, p. 304; Biddulph, Ibis, 1881, p. 64. Tarsiger ruftilatus (Hodgs. ), Sharpe, Cat. B.M. iv, p. 256; Scully, Ibis, 1881, p. 446. 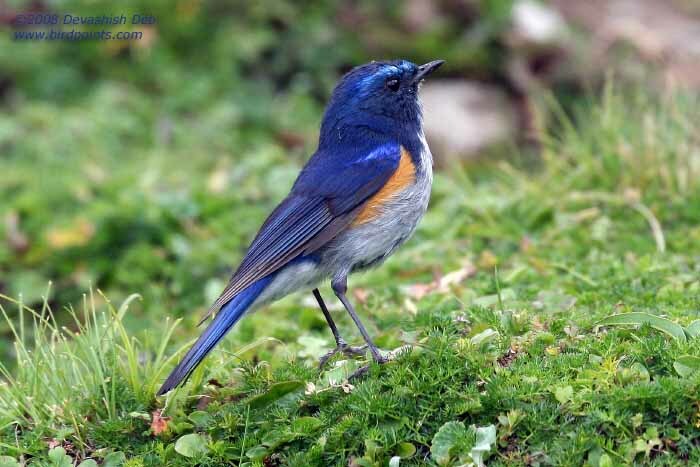 Some females have a well-marked bluish-grey supercilium, and others are without it. The young resemble the female, and have the orange patch on each side of the body and also a blue tail and rump, but the upper plumage is everywhere streaked with fulvous as well as the sides of the head and the throat. Bill black; legs and feet deep brown; iris brown (Hume). Length nearly 6; tail 2.6; wing 3.3; tarsus 1.05; bill from gape 0.6. It nests in holes in bank-sides, under tree-roots, or fallen tree-trunks. The eggs, four in number, are bluish white, very faintly marked towards the larger end with the palest reddish brown. Those markings can only be seen upon a close inspection. Length 0.74 by 0.56.